With comfortable, but powerful pressure, Falke Strong Leg Energizer Compression Socks create active recovery and energy for the legs, thanks to their progressive compression effect, lightening the feel of the legs and revitalizing while sitting, standing and walking, or during long trips and long-haul flights. 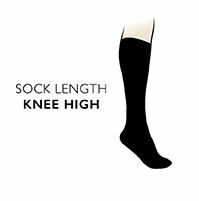 The excellent build quality gives these knee high socks wearing comfort and unrestricted freedom of movement. As well as the compression, Falke Strong Leg Energizer Compression Socks have a patented, anatomical fit and a wrinkle-free leg design.